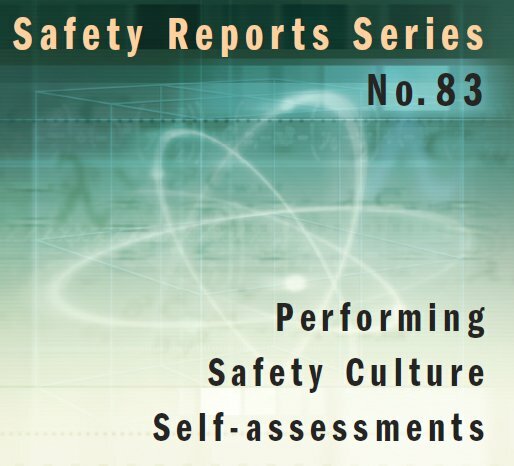 The International Atomic Energy Agency (IAEA) recently published guidance on performing safety culture (SC) self-assessments (SCSAs). This post summarizes the report* and offers our perspective on its usefulness. The Introduction presents some general background on SC and specific considerations to keep in mind when conducting an SCSA, including a “conscious effort to think in terms of the human system (the complex, dynamic interaction of individuals and teams within an organization) rather than the technological system.” (p. 2) Importantly, an SCSA is not based on technical skills or nuclear technology, nor is it focused on immediate corrective actions for observed problems. Section 2 provides additional information on SC, starting with the basics, e.g., culture is one way of explaining why things happen in organizations. The familiar iceberg model is presented, with the observable artifacts above the surface and the national, ethnic and religious values that underlie culture way below the waterline. Culture is robust (it cannot be changed rapidly) and complicated (subcultures exist). So far, so good. Then things start to go off the rails. The report reminds us that the IAEA SC framework** has five SC characteristics but then the report introduces, with no transition, a four-element model for envisioning SC; naturally, the model elements are different from the five SC characteristics previously mentioned. The report continues with a discussion of IAEA’s notion of “shared space,” the boundary area where working relationships develop between the individual and other organizational members. We won’t mince words: the four-component model and “shared space” are a distraction and zero value-added. Section 3 explores the characteristics of SCSAs. Initially, an SCSA focuses on developing an accurate description of the current culture, the “what is.” It then moves on to evaluating a SC’s strengths and weaknesses by comparing “what is” with “what should be.” An SCSA is different from a typical audit in numerous ways, including the need for specialized training, a focus on organizational dynamics and an understanding of the complex interplay of multicultural dimensions of the organization. SCSAs require recognition of the biases present when a culture examines itself. Coupling this observation with an earlier statement that effective SCSAs require understanding of the relevant social sciences, the report recommends obtaining qualified external support personnel (at least for the initial efforts at conducting SCSAs). In addition, there are many risks (the report comes up with 17) associated with performing an SCSA that have to be managed. All of these aspects are important and need to be addressed. Section 4 describes the steps in performing an SCSA. The figure that purportedly shows all the steps is unapproachable and unintelligible. However, the steps themselves—prepare the organization, the team and the SCSA plan; conduct the pre-launch and the SCSA; analyze the results; summarize the communicate the findings; develop actions; capture lessons learned; and conduct a follow-up—are reasonable. The description of SCSA team composition, competences and responsibilities is also reasonable. Having a team member with a behavioral science background is highly desirable but probably not available internally in other than the largest organizations. Section 5 covers SCSA methods: document review, questionnaires, observations, focus groups and interviews. For each method, the intent, limitations and risks, and intended uses are discussed. Each method requires specific skills. The purpose is to develop an overall view of the culture. Because of the limitations of individual methods, multiple (and preferably all) methods should be used. Overall, this section is a pretty good high-level description of the different investigative methods. Section 6 describes how to perform an integrated analysis of the information gathered. This involves working iteratively with parallel information sets. There is a lengthy discussion of how to develop cultural themes from the different data sources. Themes are combined into an overall descriptive view of the culture which can then be compared to the IAEA SC framework (a normative view) to identify relative strengths and weaknesses, and improvement opportunities. Section 7 describes approaches to communicating the findings and transitioning into action. It covers preparing the SCSA report, communicating the results to management and the larger organization, possible barriers to implementing improvement initiatives and maintaining continuous improvement in an organization’s SC. The report has an extensive set of appendices that illustrate how an SCSA can be conducted. Appendix I is a laundry list of potential areas for inquiry. Appendices II-VIII present a case study using all the SCSA methods in Section 5, followed by some example overall conclusions. Appendix IX is an outline of an SCSA final report. The guidance on using the SCSA methods is acceptably complete and clear. A 28-page Annex (including 8 pages of references) describes the social science underlying the recommended methodology for performing SCSAs. It covers too much ground to be summarized here. The writing is uneven, with some topics presented in a fluid style (probably a single voice) while others, especially those referring to many different sources, are more ragged. Because of the extensive use of in-line references, the reader can easily identify source materials. There’s good news and bad news in this Safety Report. The good news is that when IAEA collates and organizes the work of others, e.g., academics, SC practitioners or industry best practices, IAEA can create a readable, reasonably complete reference on a subject, in this case, SCSA. The bad news is that when IAEA tries to add new content with their own concepts, constructs, figures and such, they fail to add any value. In fact, they detract from the total package. It seems to never have occurred to the IAEA apparatchiks to circulate their ideas for new content for substantive review and comment. 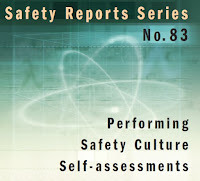 * International Atomic Energy Agency, “Performing Safety Culture Self-assessments,” Safety Reports Series no. 83 (Vienna: IAEA, 2016). Thanks to Madalina Tronea for publicizing this report. Dr. Tronea is the founder/moderator of the LinkedIn Nuclear Safety Culture discussion group. ** Interestingly, the IAEA SC framework (SC definition, key characteristics and attributes) is mentioned without much discussion; the reader is referred to other IAEA documents for more details. That’s OK. For purposes of SCSA, it’s only important that the organization, including the SCSA team, agree on a SC definition and its associated characteristics and attributes. This will give everyone involved a shared normative view for linking the SCSA findings to a picture of what the SC should look like.